With a Sky scan 2001 Equatorial mount with polar eyepiece. Saturns rings and deep space. A very sturdy extendable stand. Sun filter. 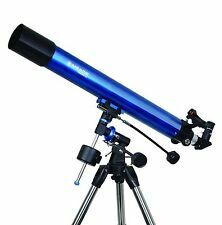 Celestron AstroMaster 130EQ Stargazing Astronomy Telescope. This has been in my cupboard for a few years so needs a bit of cleaning and TLC. It has the motor drive attached but I can’t say if it works. I think it will just need a new battery as I rarely used it. There are a couple of small washer type items missing as shown in the photos. Has a few scratch marks from wear and tear but is in pretty good condition. No instructions manual unfortunately. Please ask any questions or for more photos. Collection in Letchworth area only due to the shape and weight. Thanks for looking. This is a great telescope but has only been used 2 or 3 times before taking up residence in the garage for a couple of years! 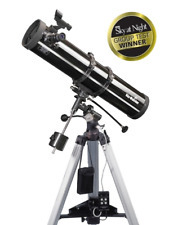 Comes with a CD manual and CD software as well as a 20mm erecting eyepiece. It does not have a box. Collection only. Sky-Watcher Explorer-130 EQ2 Reflector Telescope. Condition is excellent. Suitable for beginners or experienced astronomers. D130mm F900mm. Pick up only from M23. Too heavy to post. Celestron AstroMaster Stargazing Astronomy Telescope. Condition is Used. Dispatched with Royal Mail 2nd Class. 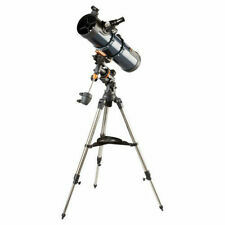 Celestron AstroMaster 130EQ Stargazing Astronomy Telescope. With 10mm and 15 wide lenses. Condition is Used. Collection in person only. Includes Barlow lens (x2 magnification) and sundry odds and ends. Sky-Watcher Explorer Reflector Telescope With Tripod, VGC. Orion Mini-EQ equatorial table mount. Has been littlie used and is in excellent, like new condition. Sky-Watcher Explorer 300 Telescope tube only. In box with no mount. Comes with a sun filter and mounting wedge. In full working condition but may need calibration after storage and travel to current location. Collection from Havercroft, Wakefield only. There's a detailed photo of it. Sky-Watcher Skymax 127 EQ3-2 Maksutov-Cassegrain Telescope in good used condition. Retailing at £459.99 elsewhere on eBay - without the additional eyepiece. Comes with original 10mm and super wide 25mm eyepieces plus a baader planetarium genuine ortho 7mm phantom mc-coated eyepiece which was £73 new. There are a few light marks on the main telescope body but nothing that detracts it affects use, please see last pic. Selling due to lack of use. Can post but collection is preferred from LS24 area, North Yorkshire. Please get in touch if you would like this posted and I will get an accurate postage cost for you. Thanks for looking. D=11mm F=900mm. Coated Optics. Good condition, Screw missing and piece between legs of tripod, Usable as is. Condition is like new and has been hardly used. EQ2 Equatorial Mount. Used but in excellent condition. Red Dot Finder. 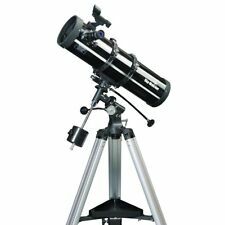 Sky-Watcher Explorer with Motorised Newtonian- D=130mm F=900mm. Sky-Watcher Explorer-130 EQ2 Reflector Telescope. Condition is Used. Slight dent to main chassis (please see photos). Lenses still good. Buyer to inspect on collection. Any questions please do ask. Happy to consider offers near or above the asking price. Sky-Watcher Explorer-130 EQ2 Reflector Telescope. Had this a few years but have hardly used it. You need to know what you are doing, especially to use the motor. Instructions say it is ideal for serious beginners. It's a heavy thing, I have listed it as collection only but can discuss if you want it posted. • Mount type Motorised Equatorial. • Type Newtonian Reflector. • Optical design Newtonian. We will always help you to have a 100% positive happy buying experience. • Magnification with eyepieces supplied (x) 36, 72, 90, 180. SkyMax 90mm F=1250mm refractor. Grab a bargain now. Sky watcher telescope D =90 F=910. I have been looking at the instructions and believe this is the EQ2 mount. collection only as this is large and heavy. this is not motorised. EQ2 Equatorial Mount. The EQ2 mount is solidly engineered and tried and tested for over ten years now. MPN : 10922. Astronomy Binoculars. Red Dot Finder. Magnifications (with optics supplied): x36, x72, x90, x180. Astronomy Binoculars. EQ1 Equatorial Mount. They also feature 0.5mm Ultra-Thin secondary mirror supports, to reduce diffraction spikes and light loss. Red Dot Finder. Magnifications (with optics supplied): x20, x40, x50, x100. MPN : 10712. Astronomy Binoculars. Quality EQ-2 equatorial mount. The EQ2 mount is solidly engineered and tried and tested for over ten years now. Plus 10mm and 25mm 1.25" eyepieces and red dot finder. It is supplied with four carefully selected magnifications as standard, and a red dot finder for easy object location. 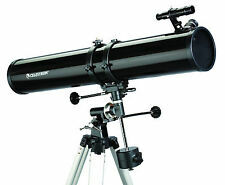 With 900mm focal length it is easier to get higher magnifications which are needed to view the planets well. Mira Ceti 1400mm/150mm. 1400mm Compact Tube. 150mm (6") Mirror. This 1145P version gives you the chance to use a better barlow. Note this is a Newtonian reflector, so the image will be. version, which has an inferior non parabolic mirror and a basic. the all important parabolic mirror and no fixed barlow. I have a really nice Unitron Model 132 4" refractor for sale. Includes the original set of 24.5mm eyepieces and a 1.25" polarex eyepiece. I have a second one so really dont need two. Its the model 132 version with danish oiled tripod, German mount with slow motions to both axis. • 10 & 25 mm eyepieces • x2 Barlow Lens • Red-Dot Finder • EQ2 Mount and Tripod. This may be because you made an impulse buy or simply chose the wrong item. It is not a "try before you buy period". Credit card.